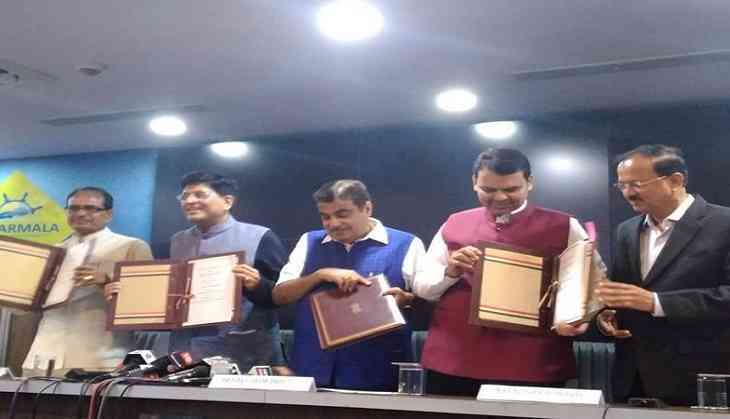 A memorandum of understanding (MoU) was signed between Jawaharlal Nehru Port (JNPT) and Ministry of Shipping on Tuesday in presence of Minister of Railways Piyush Goyal, Maharashtra Chief Minister Devendra Fadnavis and Madhya Pradesh Chief Minister Shivraj Singh Chouhan for Indore manmade Railway line project. The manmade railway line, which will cover a distance of 362 km (186 km for Maharashtra and 176 km for Madhya Pradesh) will be beneficial for freight traffic along with passenger train. The total amount allotted for this project is Rs. 8574.79 crore. Speaking on the project, Union Minister for Roads and Highways, Nitin Gadkari said, "This is a big opportunity for the development of the tribal areas for both the states. This project will reduce the distance between Delhi and Chennai also. Land acquisition has already been initiated." JNPT is financing 70 percent of this project while Maharashtra and Madhya Pradesh will have 15 percent of equity share in it. Railway will contribute in the operative ratio. With this project, a traveling distance of 171 km will be cut short from western region of India to Central India and average railway routes will also get alternatives to decongest existing routes. In the first ten years of its operation, an economic benefit of Rs. 15000 crore has been estimated. The project will be completed in six years, including one year of financial closure.